This costume will put you one step closer to being like "The Hoff." We both have one (surprising) thing in common: our idol, David Michael Hasselhoff. There are so many reasons to love the guy. First, there was his portrayal of the feisty character Dr. Snapper Foster on The Young and The Restless. Jeez, he was great in that show. Shortly after, he began his illustrious singing career. The tune, "Looking for Freedom," is still our go-to jam when we're singing karaoke with our friends. All of Germany loved him for it! Plus, who could forget his starring role on Baywatch? We'll never get tired of watching him run along the shoreline before hopping on his jet ski to save someone's life, which is why this Baywatch men's costume is so life-changing. If you want to add a large dose of Hoff into your life too, then dressing up as one of his most iconic characters is the best way to do it. 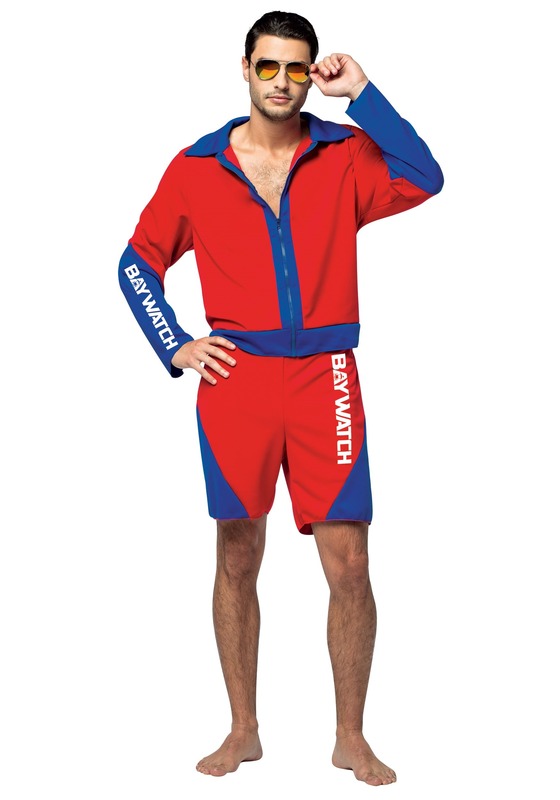 This coordinating two-piece features a zip-up jacket and matching board shorts, both printed with the word, "Baywatch." We like to wear it while we practice running in slow motion. It's harder than it looks! Add a pair of aviators and you'll be a dead ringer for the one and only, David Hasselhoff. In fact, don't be surprised if one or two people ask you for your autograph.